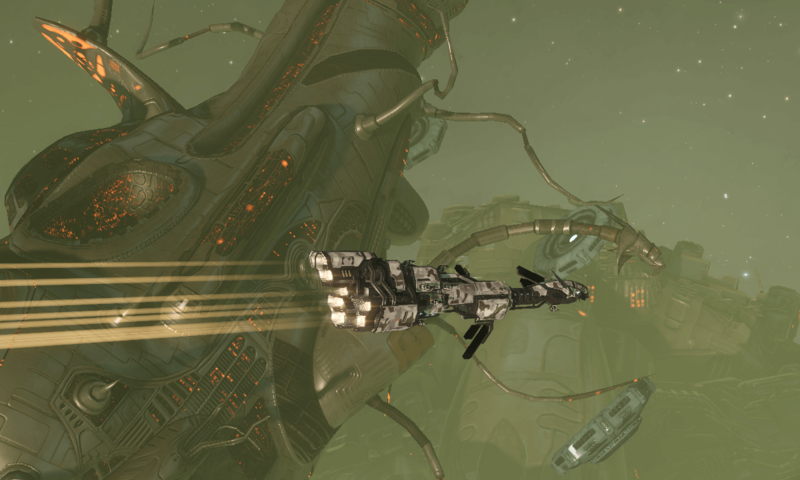 UNKNOWN – The Triglavian technology called 'Abyssal Filaments' has been discovered in Rogue Drone-controlled sites in the so-called 'Drone Regions', reports Ret Gloriaxx. In an exclusive for the Scope's Galactic Hour with Ret Gloriaxx, veteran journalist and frontline reporter Ret Gloriaxx accompanied a Thukker Tribe expedition investigating reports that Rogue Drone hives in the infested regions may contain the Abyssal Filament technology. Embedded with a Thukker Tribe long-range recon and recovery group, Ret Gloriaxx was on hand as elite Thukker Tribe infowar commandos boarded an abandoned research station deep in the infested regions. "While I wasn't permitted to accompany the commandos on their mission, despite my strong objections and citing the freedom of the interstellar press, I was able to view the video feeds as the intrepid warriors of the Vo-Lakat Special Tasks Group boarded that grim hulk! Their information warfare gear neutralized the drone infestation's command and control, and a good dose of cold, hard monomolecular buckshot was enough to take out the twitching remnants! On the command deck, we were all stunned as the commandos found a hoard of Abyssal Filaments in the depths of the hive!" Thukker and other sources have confirmed to the Scope that the Abyssal Filament technology has now entered the inventories of all major outlaw and pirate groups. Rapid dissemination of the technology has led to brisk trading in the technology on the interstellar markets, while early explorers are known to have already recovered Triglavian ship and equipment schematics from the depths of the Abyss.